In March, my students’ anticipation starts to grow. They are finishing reading their last Dorothy’s List book, discussing which one was their favorite, and eagerly looking forward to voting. My anticipation is growing as well, but for another reason. I know that the new list is about to be released. What books are going to be on this year’s list? Have I read any yet? Which ones am I looking forward to reading? I’m just as giddy as my kiddos. The books are one excitement. The upcoming Dorothy Canfield Fisher Conference is another. And this year was no exception. This year’s conference was held at Lake Morey Resort in Fairlee, Vermont. Right when I walked through the doors, I was greeted warmly and given a full bag of free books! Then on to coffee, breakfast goodies, and chatting with friends I haven’t seen since last conference. What a great way to start the morning! The conference kicked off with a Keynote from author Cynthia Lord. She gave a moving speech about how to become a writer in four steps: Read, Write, Revise, & Dream. These steps sound simple but they are peppered with lifelong lessons that empower our work as librarians. In her speech, Cynthia recalled wanting to share a book with her mother, but was turned away. Her mother felt that Cynthia should practice her reading by herself to make her a stronger reader. But we all know that sharing a book isn’t always about getting help with reading the words. It is a bonding experience. Sharing a book should be an ageless activity, happening between all ages and members of a family & community. Reading can make us closer. She suggested to “read crap” because it helps you get a better understanding of good literature and it is often fun! Cynthia also gave a great example of how librarians can empower students in their choices. A school librarian she worked with at her first teaching job always told students “Good choice” regardless of the book they chose. She realized that books are more than the words that are printed on them. We don’t truly know what a book holds for each child. We need to celebrate that they are making their own choice especially when they don’t get that power in much of the rest of their life. Some other gems from her speech was about how students equate revision with failure instead of coaching. That we need to tell students “Make it shine. It’s worth it!” Cynthia Lord’s speech help me feel this way about the work that we do: Make it shine. It’s worth it! Next I was off to a break out session. It is always hard to choose where to go. This year you did not need to sign up for a session prior to the conference but got to go where your feet took you in the moment. Luckily, handouts & other materials relating to each presentation can be found on the Department of Libraries’ Dorothy Canfield Fisher Award webpage. I chose to go to the presentation of this year’s list because I want to increase my students’ participation and knew I could get some good book talking points to get them going. I’ve read about half of them so far and this presentation got me excited to read the rest, nevertheless get my students reading. The second session I went to was the Rapid-To-Dos with Annie Brabazon and Charlie Farrell from Grand Island School. I believe this is the 3rd year in which I’ve gone to their presentation and I always come away with some great activities I can use with students. This year I got activities such as an animal sound icebreaker for the Terrible Two in which scraps of paper were handed out. Each one has a match. One was an animal, the other was the sound the animal makes. One partner kept making the noise and the other needed to walk around to find their match. Another activity was figuring out celebrity’s roller derby names for Roller Girl such as Atticurse Flinch, Smack Galifianakis, Nuke Skywalker, & Mouth Guardashian. And yet another was creating secret codes like the kind that can be found in The Blackthorne Key. Even better yet was getting kids to crack some codes such as this celebrity cipher where you have to work backwards from one clue to see if you can figure out the whole message. (Do not notice that I made a mistake! :) ). I know that I can get kids revved up using these engaging activities. Yes, it is a fabulous book by R. J. Palacio. And it is also at the crux of what we librarians/cybrarians do—we insist on fanning the flames of wonder. I am all over the map in a PreK-12th Grade School, but what I find myself working the hardest at all the time is this very task. Every time a student comes in looking for a book (i.e., pretty much all day long despite a fixed schedule! ), I am trying to match an interest, spark a passion, offer something new; every time I have those outrageously adorable PreK tots, I can’t wait to get them all riled up about whatever great read aloud I’ve chosen; each portion of the day I spend with grade schoolers, I am trying to light them up with a book, a connected online resource, and impress upon them that the capacity to wonder more and find out more is an incredible quest—better than a video game, even. Then there is the Middle School crowd: I am in a full sweat 15 minutes into our blended learning session, trying to relate to them just how awesome it is to be a member of the 21stcentury. As for the high school set… I have given up trying to be cool. I just want them to know it’s okay to read anything you want and just go for it. Finally, there is the faculty who I pepper with “cool” Ted Talks, transliteracy updates and UBD tidbits…I’m just trying to get them to enjoy letting the wonder of teaching into their over-scheduled days. Yep, that’s me—forcing wonder on everyone. It’s exhausting, and the reason I get up every day to go to school. A colleague of mine refers to a school day as an “Olympic Event.” I couldn’t agree more, and I am cooked straight through when I give that last computer bay a Clorox wipe and lock the double library doors at 4:00 pm. At the risk of sounding sassy, I am so done with “wonder.” But then I dig into whatever book I am reading that night and I am all full of wonder again! It does not take long to reboot. Boys in the Boat? How did those guys pull that Olympic win off? How did the author craft such a read? Andrew Smith’s Winger? OMG, I think Holden Caulfield has a modern-day compatriot! The DCF non-fiction thriller No Summit Out of Sight? How did that kid do all of that? Why haven’t I even begun to do anything like that? The fabulous Red Clover site Carol S. put together to use with all of the Red Clover reads? When did she have time to put that together? The wonder just keeps me wondering!! And that is just a small part of all my wonderings—a very small part, actually. Each individual at school is full of wonder, whether they show it or not. Sparking a bit of wonder in the most off-task or uninterested of patrons can be the most important part of my day. Getting a group of students immersed in a lesson on Westward Expansion by showcasing fantastic figures like Calamity Jane to bring out the true flavor of the Wild West—these kinds of moments make my day. But here’s the catch—I am realizing that many kids aren’t coming to school all set to wonder. It is not something that has been sparked in their technology-heavy young lives, and it is work to get them wondering. I guess it’s why my days are often so tiring. The wonder that should be/could be sparked early at home, outside, looking at pictures in books, hearing stories from a grown-up—is it being ignited enough? Truth be told, I am a little worried that it’s not. And this worry is what makes me go at my job with more fervor than ever. Anna Takes on ALA Midwinter 2016! I attended AASL Affiliate meetings on Saturday and Sunday. I also volunteered to represent VSLA in the exhibit hall on Saturday morning for 2 hours. Close to 12,000 people attended. Judi Paradis, MSLA, and I are in the exhibit hall. It was an amazing experience. School librarians from all over the country stopped by to visit and exchange ideas. Meeting authors is always something I enjoy. Ken Burns has a new, soon to be published, book; Grover Cleveland, Again! Mark Kurlansky is a former correspondent for the International Herald Tribune, and the Chicago Tribune, and the Miami Herald, and the Philadelphia Inquirer, and an award winning author of several books, including Salt: A World History. The ALA lounge area is always a good meeting spot, or just a place to relax and figure out what comes next. The American Association of School Librarians empowers leaders to transform teaching and learning. Working groups were formed by having all from the 9 regions write one thing they excel at and one thing that is the hidden; nobody really knows about talent. You then walked around the room to find the people/table you fit in with. The discussion focus was on building capacity, improving the organization, evolving to better meet user needs - like holding virtual meetings and webinars. We went over the revised delegate handbook. More information was added and roles were clarified. There is a new form and procedures for concerns. These will be taken to (for VSLA) NESLA and compiled. Our regional rep will then submit them to AASL for consideration. AASL is celebrating 65 years! AASL has a task force working on a plan. Meanwhile we can write thank-you letters to our congress rep and senators and start by setting up meetings with principals and district title people. The bill is nearly 5,000 page so they would not necessarily know about the library language that is included. Collaborating with outside organizations - We were encouraged to reach out to partner with local businesses and organizations. It gives us good, positive visibility in the community. Senator Cory Booker spoke at the ALA President’s Program. Senator Booker makes the case through his work and in his forthcoming book, United, that connections and compassion must guide our nation toward a brighter future. He is a strong advocate for libraries. The book awards were announced on Monday morning. The recording is now available. And of course, the exhibit hall always has plenty of new books, programs, furniture, and fun! 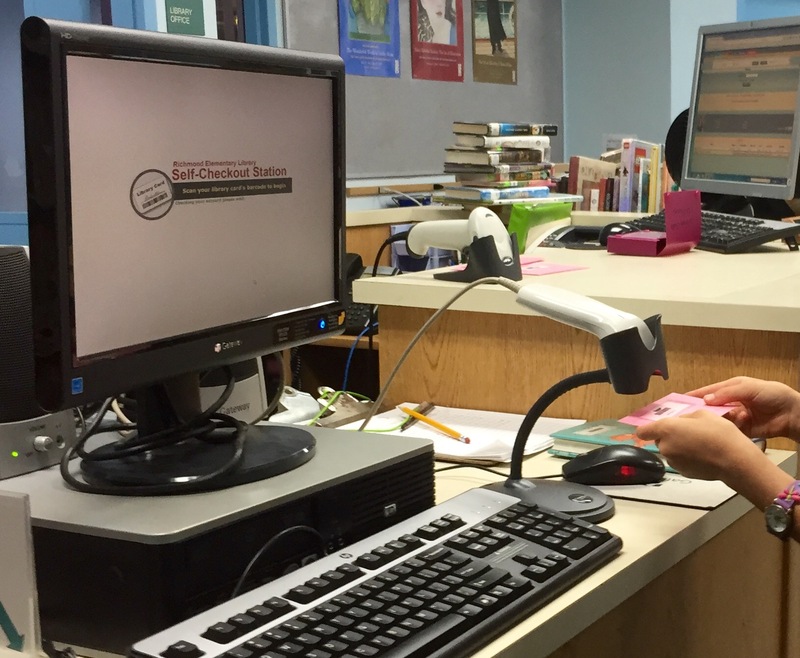 Read what tech integrationist (and stealth librarian!) Genevieve Gallagher has to say about the improvements to the Gale databases at her blog post. Several days ago a language specialist came to see me about several iPads that were unable to download the STAR Reading Assessment. I was sitting behind the circulation desk, she was standing in front of me, and in her arms she carried a tote piled with the misbehaving technology, aimed right at my eye-level, with an old label on it reading “Puppets.” The irony quietly astounded me. I instantly worried that the digital age has elbowed these age-old soothsayers dangerously out of view. The iPad can’t deliver the goods, but a puppet sure could. I imagined how enthralled a child would be at taking an assessment from one. Then in some kind of sci-fi turn of the mind I wondered if technology has become a new form of puppet? I think it has. As educators, many of us realize that using puppets can help facilitate a child’s language skills. So does an iPAD. But where did the puppets that used to be in that bin get off to? It definitely has the makings for a great picture book, doesn’t it? There is some kind of parable in all of this, I just know it. When I opened the paper at lunch yesterday I read the announcement for a fantastic little puppet show in Plainfield, VT this weekend at the Opera House. Mummenschanz had put on what I can only assume was a spectacular show this past Tuesday night at Fuller Hall in St. Johnsbury. Politics aside, Bread and Puppet Theatre is not too far from where I sit in Danville. So there are puppets—right here in VT—at least 2 shows in one week along a small corridor of Route 2. Phew. My son and daughter, both teens, ruefully watched the crowd gathering at Fuller Hall when I picked them up from sports practice that evening: ”I can’t believe we’re missing this,” said Peter. “You took us to all that stuff when we were little,” Elsa wistfully added. So true—they were young and impressionable (still are, but the subject of teens is a whole other blog, I suppose) and they LOVED puppets. Still do. Who doesn’t?? For now, I dug around in the cupboards in the back room of the library and found an unused tote for my colleague. I labeled it “iPads.” I also brought her a few popsicle sticks and some magic markers that can go in the bin for puppets. It won’t take long for that kid who finishes up his assessment to make one before going back to class. 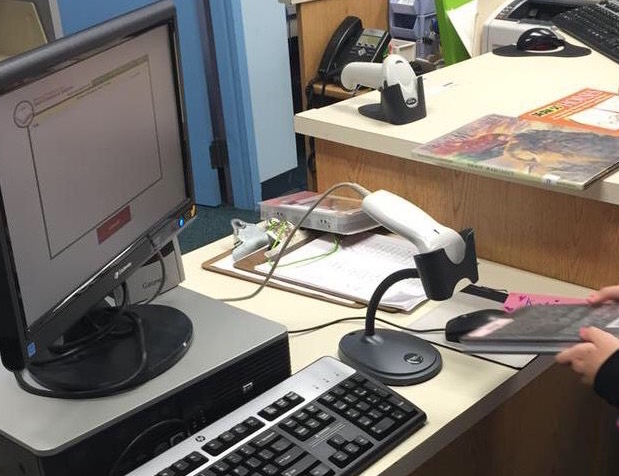 The library media center at my school, Richmond Elementary in Richmond Vermont, has received an enormous gift: a pilot year with a flexible schedule. It’s the ideal situation for school library work: an opportunity for collaborative teaching and creative learning far beyond what fits into a fixed schedule of once-a-week library classes. Please join me for the journey. As I planned for a flexible library schedule this school year, one of my challenges was to make sure that my students would be able to read library books without a fixed, once-a-week visit to check them out. I'm the only library employee and my (fabulous) volunteers aren't available for full coverage of the whole school day. In the past when I was out of the library teaching in a classroom, or in the library but busy teaching a class, the library was not accessible for students to get new books. One answer to this concern seemed to be a self checkout station, so that students could visit the library any time they needed new books. I set up our new self checkout station in early September and so far the results have been very encouraging. I often see third and fourth grade students on their way to the library as I am headed elsewhere in the building, and for the first time I don't have to tell them to turn around because their library is closed. I actually got rid of my "library closed" door sign. For these students, their library is always open. As shown in the photos above, I set up a desktop computer with a barcode scanner on an existing lower-level section of my circulation desk (I have since moved the keyboard out of the way because it's not needed). I installed my vendor's self checkout software. Then I printed out students' barcodes plus names on labels, and put the labels on bright pink index cards. The larger size and bright color makes the cards harder to lose than standard wallet sized library cards. They also function as a kind of hall pass; when students walk down the hall or into the library with big bright pink cards in their hands, it's very clear to adults where they are going and what their jobs are. Each third and fourth grade class came to the library for a group lesson plus individual practice on how to use the self checkout station. Because the cards all looked very similar, I handed out markers and asked students to put their names plus a small decoration on their cards. This way they can easily find their own cards in a class set and not accidentally checkout books to the wrong account. After each group lesson, I presented the classroom teacher with a special holder (really just a plastic index card box) for their class set of library cards. I also made a card for each teacher, both for teachers to use themselves and for students to use when they check out books on their teachers' accounts for classroom projects. When students want new library books, their teachers give them their cards and send them to the library. I plan to teach second graders to use the self checkout station later this year. I have cards made already for kindergartners and first graders, but I'm waiting until I have a good sense of what skills are needed to use self checkout before introducing it to my youngest students. My system shows students' names after they have scanned their cards, and I have asked my vendor if they could possibly add student photos to this confirmation screen. That would be a big help for my prereaders. The biggest concern I have heard about the new self checkout system is book loss. Some staff members and parents have asked me if I'm worried that the library will lose books if I'm not checking them out myself. My response has been some version of, well, the library loses some books anyway because students forget to check them out at the end of library class even when I'm there. And the books almost always find their way back to the library anyway; our overall loss rate is very low. Our school community also has an established culture of trust around loaning out library books; students take home 10 library books each over the summer and the return rates are always very high. But even if I begin to see a higher loss rate with the self checkout system in place, I will think very hard before I consider removing it. Everything in education has a cost, and if the cost of increased library access for students is a slightly higher loss rate then the trade off will be worth it. In many ways it's a matter of perspective: are librarians book police, most concerned with keeping books safe? Or are we book promoters, most driven to get (awesome, life-changing) books into students' hands? A final note about book loss: my third and fourth grade students are having so much fun being independent and checking out their books having so much fun being independent and checking out their books themselves that I'm predicting my loss rate will go down. I have yet to see a single student forget to check out a book as he or she leaves the library. If you have any questions about self checkout at my school, please feel free to contact me through this blog or at my school email, beth.redford@cesuvt.org. Hi Amy! We use OPALS from Media Flex. http://www.mediaflex.net/index.jsp I have been very happy with their products and customer service. The self checkout system is a new module for them so my school is beta testing it a bit, it’s not in full release yet. It does not have checkin at this time so I have students return books to a checkin cart, then I check them in when I have time. I have set their checkout limits higher and overdue periods longer to accommodate the fact that sometimes their returned books are not yet checked in when they check new books out. Hope that makes sense. Let me know if you have any other questions. Good luck! Update: I have since taught second graders to use the self checkout station and they are using it independently as well. Recently I had a very interesting conversation with an elementary reading specialist. She came into the library to get, of all things, joke books. Of course, I thought she was kidding--and, yes, I get the pun there! Although our collection does not have a large selection of these, it does contain a few older tomes, so I showed her where to look and chuckled to myself (of course I did--joke books, get it?!). When she came over to check them out she told me why she was getting these books and I was intrigued. She has been reading a lot about flexible thinking and the research that is being done on how it affects a reader's ability to comprehend. Trying to find some new in-roads with students who can decode proficiently--some even above grade level--but seem to understand little of what they read, she has been playing various games with them to understand more completely where the breakdown for them occurs. She uses sets of picture cards and asks children to sort them (by color, by initial sound, etc. ), and then she asks them to try a new way, and often they can't. They have difficulty understanding that an object could belong to more than one category at a time (i.e., a wagon could be in the "red" category and the "W" one, too). What this teacher is discovering is that these students have a way of perceiving information in a set pattern and that their brains do not process information on multiple levels as easily as one might assume. When these children read, they view words as the result of blended sounds. The rigid adherence to their understanding that reading is making these sounds prevents them from comprehending while making them. Research is showing that playing these categorizing games and coaxing the child to become more flexible in their thinking--indeed retraining the muscle of the brain--can help a reader break the comprehension barrier. Our brains are quite plastic, a child's especially. Pathways can be remolded. Positive change can and will occur with repeated "workouts." So, why the joke books? Well, this teacher got to thinking that jokes and puns force one to think flexibly, too. They are, basically, word games and mind games. For example, a riddle requires a person to reframe words, make illogical leaps that still make sense even though it is silly, and understand that words can have double-meanings. A joke is funny--that breaks the I-am-reading-this-sound-for-sound-right-now rigidity. The give and take required between two people telling jokes and playing with words asks the participants to pay attention to language in a whole new way. It's a whole new workout at the brain gym! If you had told me in September I was going to be ordering joke books this year, I would have laughed (I know, I know). But it is a totally valid and serious thing to do. It is another way the library collaborates with teachers on behalf of the varied learners it serves. The few dollars spent on these books will provide limitless learning opportunities for countless kids. The specialist's lessons will be planned, of course, but the spontaneity and teachable moments that will occur because she is sharing riddles and giggles with a group of children will provide the authenticity that all the research says people need to learn something on a lasting level. I guess the joke's on all of us, in a good way. Working together to load and then unload the bus of countless boxes of donated items at the food shelf inspired this from Carter: “I love thinking of how happy the hungry people will be when they see all the food we donated.” In fact, after weighing all of the boxes, the students learned that the total load was 1130 pounds – over half a ton! Our tour leaders, Anna and Chef Midhat engaged the group with many facts about the food shelf and its beneficiaries. Taste-testing the chef’s specially prepared baked carrots was a delicious way to end the hour-long visit. In a written reflection after the trip, fifth grader, Molly expressed, “I think that just being a part of something that matters a lot in the world can make a big impact on others and yourself. Having everybody in our school community donate food can show you how much people care and how much people want hunger to stop.” It’s a feeling that is shared by the entire Orchard School community.